New Zealanders are much more likely to support Government funding to go to public transport than they were 20 years ago. 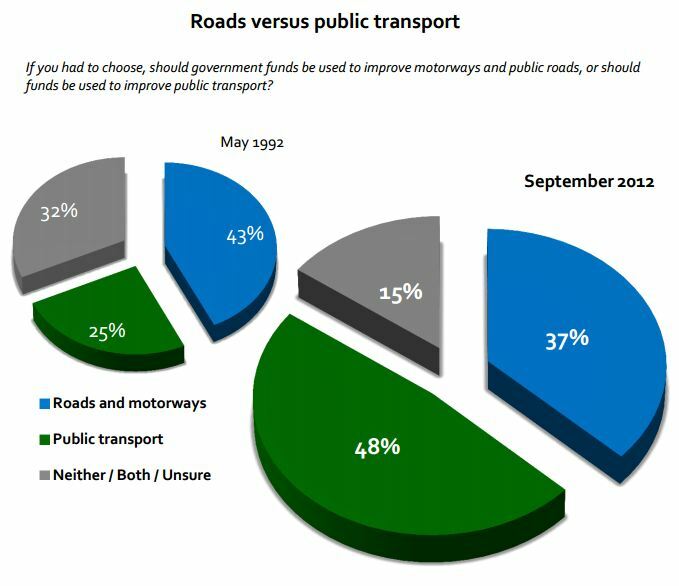 In 1992 they plumped for motorways by a 43% to 25% margin over public transport. In 2012 public transport is preferred by a 48% to 37% margin. That is a big disconnect between what the public want, and what the government is doing. There indeed are some massive discrepancies between need and provisions, skewed I think by ideology and the dead weight of conservative thinking (or lack thereof). There are about 1.27 million cyclists in NZ – about 31% of the population (by comparison, there are about 3 million people with car licences). There are about 750,000 regular cyclists (cycling at least once a month) in NZ – about 18% of the population. About 144,000 or 3.5% cycle nearly every day. Yet these people get less than 1.2% of the road transport funding. Even taking into account the inexpensive nature of providing for cyclists and pedestrians, cyclists and pedestrians are getting ripped off. Yet, the road network is largely built, there are still big gaps in PT infrastructure, and the safe cycle network has barely begun to be built. The government should throw away it’s current plans and come up with better ones. Start with 2 questions -what are the gaps in PT infrastructure, and how much money does local government need to build a safe cycle network? Just because someone is stuck in traffic on their work commute, who cares? They have alternatives, and we are not here as taxpayers to satisfy every whim of the happy motoring brigade. I’m not a cyclist myself (though trying to motivate myself to be one) but I do believe that it’s the low-hanging fruit we should be throwing some spare change at, at least. It’s peanuts compared to the total transport budget. I really can see people flocking to it for short trips and in terms of the savings on the pocket, health improvements etc, it’s criminal not to be doing more. So which century is this government’s thinking in, then? This really is an extraordinarily one sided policy, capture by special interests; a big fat sloppy kiss to the road freight industry. And remember if concerned about the cost of filling your tank up now that the price we pay is currently held down by the unusually high NZ dollar. There are huge upside risks to this figure, and we are not investing in alternatives. In fact this gov are working incredibly hard to discredit both the ready to go oil and car free projects and the need to build any options and resilience to both passenger and freight systems. The reverse of prudent sensible governance. Not just the government Patrick. As mentioned on another thread, AT are still caught in the ‘road trap’ in the Auckland Plan. That is the section that has essentially jumped over into PT, ( given the Roads result only shifted from 43 to 37%) so it would be really interesting to know whether this was a reduction in the “both” camp, or the “neither/unsures” jumping over to PT. You’ll agree the trend is undeniable and dramatic….? One result a trend does not make, but yip something is happening, which is why it would be useful to see in detail what had happened to the 3 remainder classifications…. I think the result would be even more clear cut. A national Colmar Brunton public opinion poll released today shows seven out of ten New Zealanders want to see more Government money going to fund public transport improvements in major towns and cities. 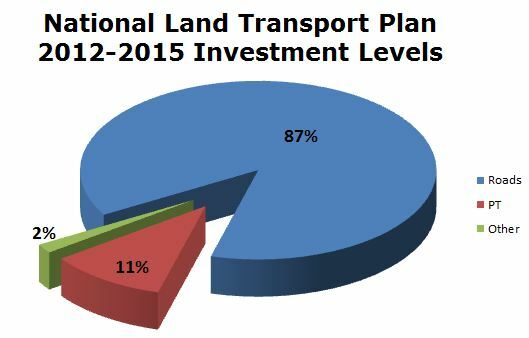 Only 1 percent of total land transport spending is allocated to new and improved public transport. In Auckland the rate is even higher with 78 percent of people in agreement that the government should spend a greater percentage of its Land Transport Budget on improved public transport infrastructure in major urban areas or cities over the next decade. “The Roads of National Significance and other roading projects are currently gobbling the lion’s share of government transport money, when what New Zealanders want is more investment to make public transport in cities better,” says WWF-New Zealand Climate and Energy Advocate Lee Barry. You would need a survey that pairs the spending and taxing. Something like “X% of Kiwis are prepared to pay 5c in the dollar more for a world class land transport system…”. At the end of the day, nothing to write home about with road or rail. Where does it say anywhere that people need to pay more tax? You are being rather disingenuous here.. 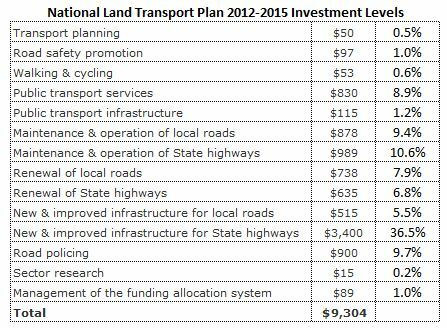 The argument is that we should spend LESS on roads and instead spend it on PT; much more bang for your buck. Why would you need that? The question relates to government funds allocated to transport, not what extra people would be prepared to pay (though that would be an interesting question to pose, to see what percentage would pay more to speed up PT (or other) spending). Those stats are amazing, one knows there is more spent on roading but to see the reality in the stats is a real shock. This makes this post one of the best so far this year. The NLTP is funded by road users on the basis that it will be spent to the benefit of road users. It would be better to look at what is being funded through the consolidated fund. Quite! Motoring taxes are entirely hypothecated to the NLTF by law, and RUC is set according to forecast expenditure attributable to RUC-liable vehicles, despite what some conspiracy theorists think. They are qualitatively different from other taxes. The NLTF is paid for with motoring taxes and hypothecated to the NLTF, and the NLTF funds roads, PT and cycle and pedestrian infrastructure. I see no problem spending more on PT and cycling without breaking the hypothecation. PT and cycle infrastructure decongests roads afterall. Absolutely nothing here that precludes changing the balance of investment more towards Public Transit. The defining principle is basically what the government wants as expressed in the GPS. And the GPS, Government Policy Statement, is just that; a statement of government policy. No law binding spending by mode. In fact given the inclusion of environmental sustainability as one of the five considerations 20. (2)(c) there is arguably a case that this government is in serious breach of the Act! Meh they’re all taxes to me really. Should we be spending alcohol excise taxes on building pubs? Are alcohol excise taxes legally hypothecated? Do they exist to pay for the infrastructure involved in producing the product in the absence of directly charging people for alcohol? No. RUC is a road user charge, it bears a direct relationship to the amount of road usage and damage done to the roads. Fuel tax is a proxy for this. Neither would exist if there was full road pricing. However, neither are a sin tax designed to deter people from driving. Alcohol tax is intended to deter consumption of a privately provided product after they have paid for the full costs of production, they are quite different. It isn’t even related to the putative health costs of alcohol. Ok so you like the comparison with alcohol excise? If that was the case then then all alcohol excise would have to be spent on bars and pubs, on the promotion and ease of further consumption. Because that’s how we currently spend fuel excise, on infrastructure to consume more of it. And then of course it is a poison just lie like alcohol, it causes incalculable negative externalities like alcohol (and, like alcohol, it can be a lot if fun, and generate income doing so) death, injury, pollution, the frying of the entire biosphere….. So what was your point again? Oh yes fuel excise and RUCs are a special uniquely golden tax that should never be used wisely only ever for the perpetuation of their own little industry. And why? Because of an act of parliament, well you know what, those things can change. Nonsense. The only case for alcohol excise is as a sin tax to pay for health costs, but the case for RUC (which isn’t far from being a price for road use) and fuel excise is to pay for infrastructure that otherwise wouldn’t be paid for. No alcohol tax and amazingly it would still be supplied as would bars and breweries and vineyards. So that comparison is specious. If fuel excise is an externalities tax, then set it as one. You need one on diesel and bio-fuels as well, but there is no fuel excise on those because vehicles operated by a fuel not tax pay RUC, so in fact the system is set up as a proxy for road user charging. Indeed the externalities are calculable and have been, so there can be arguments made about this. Feel free to propose fuel taxes as sin taxes, argue for them to be hiked to the hilt, and spent on welfare, health, education and the criminal justice system if you want, but that isn’t the status quo. Of course that means agricultural diesel, rail diesel, marine diesel all should be taxed too, if you really care about the externalities it will be a tax on fossil fuels. Don’t forget to tax coal and firewood too, which actually create the bulk of pollution in cities outside Auckland (try the local air quality in Timaru or Napier mid winter – it isn’t transport doing that). After all, why let economic efficiency get in the way of a desire to punish people for using the modes you dislike why let the tool of price get in the way of grand old fashioned central planning to make sure people and goods move when, where and how you want. It was how things were in the 1970s, it kept the average folk out of planes, made sure NZ’s vehicle fleet averaged being 15 years old, and saw the money spent on transport largely driven by marginal electorates and political whim. Sadly we’re somewhat back to that now with RoNS, and the other lot would be the same way. Exactly. There most certainly needs to be a better taxing of the full externalities of burning fossil fuels, and how better to do that the mechanism of a fuel tax, of course including coal, the grabbiest of all the FFs. RUCs are an under-calculated asset damage tax, so they are there simply to maintain and improve the existing road network and of course as you full well know 50% of the funding for the roads most often used actually comes from property taxes so you can get right off your user pays hobby horse. But back to the externalities. Instead of adding 9 cents a litre recently to build more uneconomic duplicate highways this income should be used, as a carbon tax, to invest in the shift of our movement infrastructure away from oil dependence and to our abundant and mostly carbon free electric resource. Tax should be employed intelligently to liberate (sorry) the economy from this addiction not further embedded it in it. RUC and petrol tax are very evidently not used to pay solely for the damage done in using roads. RUC and petrol tax are primarily used to build new roads. Why should the primary source of transport funding be restricted to funding only one transport mode? As a frequent payer of this tax, i demand that instead it be spent on infrastructure to transport people and goods. Are you suggesting that road users can’t or won’t benefit by investment in PT. Getting those off the road that would rather take an alternative would help to free up the roads for those that do want to drive. They can benefit, but most PT subsidies do little to reduce congestion. The only cases where it happens are in larger cities at peak times when such services demonstrably result in a modal shift from car drivers to PT use (not cycling/walking to PT and not encouraging people to relocate further from work). A significant proportion of PT users would use it anyway, and PT commuters to CBDs tend to be on above average incomes. Yet the whole PT reduces congestion argument is a poor second best to using road pricing to effectively target the real problem – demand exceeding supply. If all PT subsidies were based on reducing congestion then that is economically efficient in the absence of road pricing, but there is no particular reason why the real problem of congestion can’t be targeted directly. I couldn’t give a rats arse about tradic congestion to be honest. You can throw good billions after bad to try and fix it, but its far easier just to let it be and use transport that isnt affected. I’ve barely experienced it in the last six years or so and couldn’t be happier with the situation. I think most people would b happy to be in the same boat. is it that those that have to burn fuel aren’t allow a word against the practice? All very well, but so what? The current lot were elected based on a commitment to spending a fortune on major state highways, until people vote differently that’s how it works in a liberal democracy. If you did a survey about healthcare, you’d likely get most wanting money spent on children, rather than on mental health or people in the last year of their lives (which is where around 80% gets spent). Government by opinion survey would see a ruthless attitude to crime, and bankruptcy as people want to pay less and get more from the state. Moreover, you could ask a similar question about “should fuel tax and road user charges be spent mostly on roads or public transport”, and people would probably say roads, you could ask “should people who ride public transport pay the full costs of their trips or get subsidised by people not riding public transport” and wouldn’t like the answer. The real survey is shown by usage, which is fairly static in terms of consuming transport across the board, except aviation. You know full well that people vote in national elections based on issues other than transport. If we got to vote policy by policy it might be different but we don’t. As for your last comment, people use what is quickest, easiest and most convenient for them, which is dictated by past investments. It is no surprise that if we only invest in one mode for almost 60 years then that is what will be used the most. For decades money was poured into railways and tramways, and as soon as people could afford to buy cars, they did, and local authorities found people didn’t want to pay rates to renew tramways, and governments found people didn’t want money spent on passenger railways either. You are acting as if these decisions were made without any awareness of what people wanted. They expressed it by making big commitments to personal mobility, and electing politicians who chose roads over public transport. By the early 1970s all of the commuter public transport services were losing money, being mismanaged by union dominated local monopolies that regularly went on strike to demand more and more, as local authorities starved the bus fleets of capital investment. Bear in mind the depreciated life of a road is around 30-40 years, a railway is slightly more, and rail rolling stock about 30-35 years. Given motorists are willing to pay, on average, for the infrastructure costs of the roads they use, but urban public transport users are not prepared to pay for the operating costs of many of their services (let alone the capital), it indicates that people’s preferences aren’t reflected in willingness to pay. By contrast, intercity passenger transport doesn’t raise any of these issues, ever wondered why? Sorry it doesn’t suit your ideology but that is simply not how the demise of trams in Auckland happened. Previous posts here about it if you need to refresh your memory. I suspect we’d also have less immigration; people would still be allowed to smack children; and the treasury would be scratching their heads figuring out how to lower taxes, increase public spending, and reduce government debt at the same time. You only have to look at NZ’s bizarre series of referendums to realise how crap most people are at making coherent policy. I find this poll to be very strange. I’m strongly in favour of both as an answer, but only a subset of 15% of people agree with me. Do greater than 85% of people really want to neglect some aspect of our transport system? The real point is how things have changed, when the same question was asked in 1992 and in 2012. The tide is turning – sorry liberty and swan! Funny thing is its becoming clear that the road lobby over-played their hand with their man Joyce, just got too greedy. It’s like they subconsciously suspect the game is up. The insane haste and imprudence of the whole RoNS programme was bound to cause a reaction. It is this that has at last politicised the sector. Just going for the majority of the money instead of all of it would have allowed the transport spend to trundle along below the radar for the foreseeable…. Ah the glory of unintended consequences. Hubris was always going to be his downfall. Of course being voted out will mean a secure life of endless directorships for our Steveo, he’ s certainly invested our tax well in his future….. But apart from a few blog posts here and there is it even on peoples’ radars? I mean how few have even noticed their rates going up because of the decrease in grants to local councils for local road maintenance, but that is happening. You and me might like to think they’ve overplayed their hand, but aren’t we both (or us all) just slapping them with a limp lettuce leaf? Ain’t the average TV3 News watching audience (or whatever is the mainstream gullible stereotype) still thinking Key and co are made of top class sausage? Or have they started noticing they’ve gone a bit off in the fridge? Er? See poll result above, that is a big change and the trend is clear, why else would retrogrades like the self described liberty be rushing to the keyboard to try to hose it down? You can’t vote him out, he’s #4 on the party list, and so accountable to national party interests only. The main downside of MMP. Even a small-ish increase in Public Transport share from 11% to say 15%, would be a dramatic improvement. The problem is that this presents a huge funding challenge with an estimated cost of $50 billion dollars over the next 30 years. So the BIG question will be; “How will this be funded?” It is unlikely that the government (taxpayers) will be able to meet this cost because of the GFC, and their need to find $30 Billion to rebuild Christchurch. It is also totally unrealistic to expect Auckland ratepayers to bear this huge cost. So I believe that the fairest solution is to impose user-pay ‘Auckland taxes’ on people who are creating the problem….and who will become the beneficiaries of this improved transport system over the next 30 years. A. An ‘Auckland transport infrastructure tax’ on the estimated 30,000 people per year (including Kiwis relocating to Auckland) who are projected to choose Auckland as their new home. 1. Impose a $2,000 per person levy (not applicable to immigrants if they chose to live anywhere else in New Zealand) with a cap of $5,000 per family. 2. This to be levied over the first 5 years on an interest-free basis and would provide a total income of around $75 M per year ($2.25 Billion over the next 30 years). B. A levy of say 40 % on all second-hand Japanese imported cars that are registered in Auckland for use by those who live in Auckland. One of the reasons that Auckland roads are becoming so congested is that second-hand cars (especially Japanese imports) are so inexpensive that many households now own 3 or 4 cars. Assuming that say 50,000 second-hand cars per year on average are imported for Auckland owners over the next 30 years, and that this levy is say $3,000 per car, then this represents an additional source of funds of $150 M per year ($4.5 Billion over the next 30 years). Total number of cars = 1.4 M cars per day at $2-00 per car = $2.8 M per day = $1 Billion per year ($30 Billion over the next 30 years). As you can see, the total revenue generated from just these three sources would be $1.125 Billion per year which would service a debt of over $20 Billion repayable over 30 years. N.B. As an incentive for people to use public transport, a portion (say 10 %) could be used to further subsidize fares and to improve the frequency and service of public transport system (Carrot). These are just a few ideas on how we might begin to fund the infrastructure required for Auckland to become a World-class city that we all aspire to. The alternative is to keep fiddling with problem and trying to play `catch up’ as we have been doing over the last 30 years. The likely outcome of this is to reach `traffic gridlock’ in about 5 years time! First of all, there is currently a group of people from various interest groups, organisations and agencies working to look at the issue of transport funding. The idea is for this group to build a consensus around what the best options are for raising additional money to pay for transport are. Things like network pricing are definitely on the list that they are considering. Rail freight is uneconomic in a small country like NZ, except for bulk export and import items – because of the high cost of trans-shipping. Yes true and that is why it is so important that we get recreational non-commercial drivers off the roads so that our inefficient road based transport system can function as well as possible. Without its own ROW the road freight transport system needs as little competition as possible for the space available. It was a big surprise to me how little freight in Europe is transported by rail while the US moves huge amounts of freight by rail. However, this is because the European system is full of passengers while the US system is massively underutilised by passengers. A very different situation to NZ. However, coastal shipping must be something we could look to grow? Oh please what nonsense. We need to get the murderous huge rigs off the roads and onto the already existing grade separate freight network: Rail. And rail is not uncompetitive; road freight is subsidised hugely by private road users and property tax payers. There is no level playing field and nor need there be unnecessary trans-shipping with rail. Truck freight is also moved between different vehicles for distribution. We just have decades of investment in one mode only and at great cost to the nation and short term policy that tilts the playing field..